Are you a state or municipal employee and are being retaliated against for raising issues relating to your employment that you believe are of a matter of public concern? Has your supervisor warned you that you are must keep your participation in a sexual harassment investigation strictly confidential or could termination should you disclose your knowledge of sexual harassment or other form of discrimination to anyone, including your spouse or employment lawyer. If yes, your employer may have violated your First Amendment rights. The law is well-settled that the government infringes upon the constitutional rights of a public employee if it restricts him or her from discussing matters of public concern. It is likewise well-settled that complainants of discrimination and any participating witnesses are engaging in “protected activity” in their participation of an investigation of harassment under the United State and New Jersey constitutions as well as under federal and state discrimination laws, including Title VII and the New Jersey Law Against Discrimination. A public employer runs afoul with the First Amendment rights of a public employee when it attempts to chill their ability to freely communicate with the public matters that are of a public concern. The United States made clear in the Pickering v. Board of Education, 391 U.S. 563, 574 (1968) that the First Amendment provides for strong protections for public employees from being retaliated against for speaking about issues and matters of public concern. 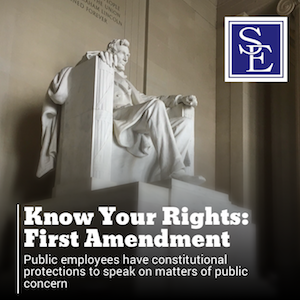 The Supreme Court noted that the reasons for providing public employee strong First Amendment protections is because public employees often have knowledge the public would want to know about governmental operations. For this reason, the Court noted that it is essential that public employees can discuss and debate questions of public importance in a free and unhindered way without fear of retaliatory discharge. Following the Pickering decision, the Supreme Court made clear that the speech of an employee must be of a “matter of public concern” to receive First Amendment protection. Connick v. Myers, 461 U.S. 138 (1983). Courts remain concerned about retaliation protection in areas of public concern because the fear of discharge could “chill” employee participation in public affairs and damage larger societal interest. Id. at 144-45 (1983). In reaffirming the importance of the Pickering holding, the Supreme Court stated in San Diego v. Roe, 543 U.S. 77, 82 (2004) again recognized that public employees are often the members of the community who are likely to have informed opinions as to the operations of their public employers and warned that if were they not able to speak on these matters, the community would be deprived of informed opinions on important public issues. The public’s interest in receiving informed opinion is as much as it is the employee’s own right to disseminate it. The Supreme Court has afforded First Amendment protection to complainants and witnesses who are required to testify in cases of public concern. Significant public concerns include matters of governmental fraud, governmental waste, corruption, sexual harassment, discrimination and retaliation. Someone who complains of unlawful conduct that is of a public concern is engaging in protected activity if he or she can show that the complaint was made in good faith and that the complaint was reasonable. A witness or person required to participate in an investigation or lawsuit concerning matters of public concern are considered engaging in protected activity. Courts will balance the strong need to protect public employee’s speech of matters of public concern versus the public employer’s interests in maintaining order, discipline, harmony and professional working relationships in its operations. The balancing test is always fact specific and court’s will analyze the important of both the public employee, the public employer and the public at large in determining what speech is afforded First Amendment protection and speech is not. In New Jersey, our state’s Supreme Court has made clear that watchdog employees who engage in whistle-blowing in connection with their official duties are protected from retaliation. This means that just because a particular employee has job responsibilities that may include raising issues of unlawful conduct does not mean that these employees can be retaliated against for doing this aspect of their job. Other states outside New Jersey have not all reached the same result as in New Jersey and do not provide watchdog’s with job protection and the right to be free of retaliation. It is always important to speak to an experienced employment lawyer in your jurisdiction to determinate the viability of a First Amendment retaliation claim. Should you live or work in New Jersey and believe you have been retaliated against for complaining about issues of public concern, or participating in an investigation or lawsuit, please fee free to contact one of our First Amendment lawyers to discuss the specific facts and circumstances of your matter.